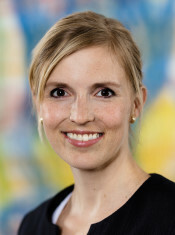 Josephine Ackerman started her career at a family-owned company before working at a strategy consulting firm for a number of DAX corporations throughout Germany. In 2012 she joined Deutsche Bank, where she accompanied various projects. In 2015 she won an award as Germany’s best project manager under the age of 35. Ackerman is regarded as an intrapreneur and management talent, she was engaged with innovation projects at the communications unit and worked for the bank’s global chairpersons on the strategic orientation of the Corporate Social Responsibility Agenda. In 2016 she became Deputy Global Head and Chief Operating Officer of the Art, Culture & Sports division that is responsible for the bank’s global commitment in these areas. Privately, Josephine Ackerman creates art in her studio in Frankfurt and is dedicated to the development of children in the women’s organization YOUNG WIZO. Wolf Bauer studied journalism and art history and then worked as an author for the ZDF series “Kennzeichen D”. He joined UFA in 1980 and in 1991 became chairman of the board. Following the merger of UFA and Pearson TV in 2000 to form FremantleMedia, he was promoted to the board of the internationally active production company. Under his leadership UFA developed into a powerful production group and market leader in Germany. Wolf Bauer has produced over 80 TV-movies and overseen the launch of more than 20 TV series. 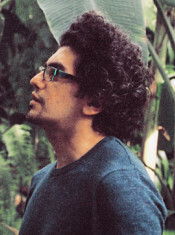 As a producer for UFA Cinema he was also responsible for numerous feature films, such as “The Physician”. 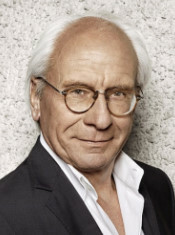 During his time as managing director, UFA also produced many excellent successes such as the historical TV-event movies “March Of Millions” and “Dresden”, and the miniseries “Generation War” (International Emmy Award 2014) and a great many TV-movies such as “Naked Among Wolves.” Wolf Bauer has also been on the board of trustees of the Bertelsmann Foundation since 2008. Maike Mia Höhne was born in Hanover in 1971. Between 1994-1999 she studied visual communication at the Hochschule für Bildende Künste in Hamburg, the Escuela de Bellas Artes in Havanna as well as the Escuela International de Cine y Television in San Antonio de los Baños, Cuba. 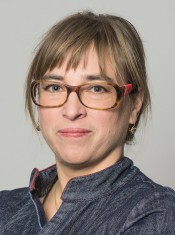 After working in Buenos Aires, Argentina, she completed her post-graduate studies at the Hochschule für Bildende Künste in Hamburg with a focus on film. Since 2001, she has worked in as a freelance writer, curator, producer, photographer and director in various contexts. Her films are distributed by arsenal experimental and Kurzfilmagentur. She has also been active for many years as a lecturer and moderator at film events. Maike Mia Höhne lives in Hamburg and Berlin. She has curated Berlinale Shorts since the summer of 2007. Basim Magdy was born in 1977 in Assiut, Egypt, and now lives in Basel and Cairo. He has created a multifaceted oeuvre in recent years encompassing film, photography, slide projections, installations, and works on paper. At the center of all of his works are structures of seeing, remembering, and archiving. Basim Magdy has participated in numerous international group exhibitions, including the Sharjah and Istanbul Biennials in 2013 and La Biennale de Montreal and MEDIACITY Seoul Biennial in 2014. 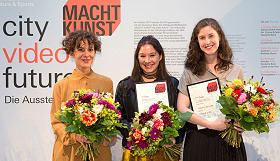 After Wangechi Mutu, Yto Barrada, Roman Ondák, Imran Qureshi, Victor Man, and Koki Tanaka Basim Magdy was 2016 Deutsche Bank's seventh ‟Artist of the Year“. After its presentation at the Deutsche Bank KunstHalle in Berlin, his solo exhibition “The Stars Were Aligned for A Century of New Beginnings” was on view at the MAXXI (Rome), the Museum of Contemporary Art (Chicago), and the Arnolfini (Bristol). Franziska Weisz, born in Vienna in 1980, played in Ulrich Seidl’s “Hundstage” (1999) before completing her studies in developmental and environmental policy at King’s College in London. During her studies, she took on various small roles and subsequently entered the acting profession fulltime with a role in Jessica Hausner’s “Hotel.” The film premiered at Cannes in 2004 and won the European Shooting Star award at the Berlinale 2005. Other performances in films featured at the Berlinale followed, including “Distance” (the opening film of Perspektive Deutsches Kino 2009, directed by Thomas Sieben), “Das Vaterspiel” (Panorama 2009, directed by Michael Glawogger), “Der Räuber” (2010 competition, directed by Benjamin Heisenberg and Nikolaus Geyrhalter), “Renn, wenn du kannst” (the opening film of Perspektive Deutsches Kino 2010, directed by Dietrich Brüggemann), and most recently “Kreuzweg” (directed by Dietrich Brüggemann), which had its world premiere as an official competition entry in 2014 and was awarded the Silver Bear. Other motion pictures with Weisz include “Hannas schlafende Hunde” (2015, directed by Andreas Gruber) and “Treffen sich Zwei” (2015, directed by Ulrike von Ribbeck). For TV, Weisz’ roles in the series “Der letzte Bulle” (2012/2013, directed by Sophie Allet-Coche), in the detective series “Janus” (2012/2013, directed by Andreas Kopriva), and in “Landkrimi: Kreuz des Südens” (2014, directed by Barbara Eder) are particularly noteworthy. In addition, she played in the 2015 television film “Irenes Bruder – Ein Geheimnis im Dorf” (directed by Peter Keglevic), “Die vierte Gewalt” (directed by Brigitte Bertele), which had excellent ratings, as well as the American series “Homeland” (directed by Seith Mann). Furthermore, since 2015 she has been a new “Tatort” investigator alongside Wotan Wilke Möhring (“Zorn Gottes,” directed by Özgür Yildirim/ 2016, and “Böser Boden,” directed by Sabine Bernardi). Her cinema projects in 2016/2017 include “Die Anfängerin” (AT), directed by Alexandra Sell, “Komplett von der Rolle” (directed by Sabine Derflinger), and “Arthur & Claire” (directed by Miguel Alexandre). Among the most recent television productions with Weisze are “Willkommen in der Patchwork-Hölle” (directed by Oliver Schmitz) and “Ich will (k)ein Kind von dir” (directed by Ingo Rasper). She is standing in front of the camera for “Tatort: Dunkle Zeit” (directed by Niki Stein) in Hamburg until mid-June 2017.